guardianwolf216: Spitfire 2.0. The 2nd Spitfore in Season 2. In case it’s not obvious, guardianwolf216 used her 가장 좋아하는 ‘Spitfire’ screenshots (Infiltrator) and re-drew it as Bart/Impulse and Cissie/Arrowette.. Wallpaper and background images in the 영 저스티스 club tagged: young justice arrowette cissie bart impulse. This 영 저스티스 photo contains 애니메이션, 만화, and 만화책. Please tell me this isn't photo shop! boo u just crushed my dreams! 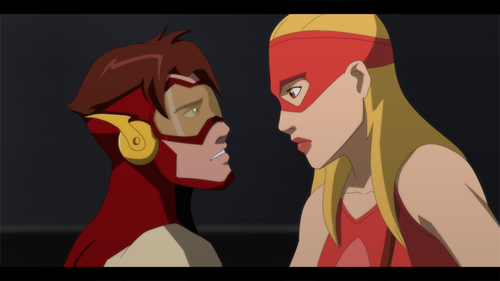 Wait isn't that the part in episode 6 when Wally crashed into Artemis only with Bart and Cissie? My dream is crushed to I really want Spitfire 2.0! I just wrote a story abot this on Fanfiction! WHo THE HELL IS SHE ???????????!!!!!!!!!!!!!!!!!!!!!!!!!!!!!!!­!!!­!! !­!